By the middle of the 19th century good quality milk was much more easily available than ever before. Until this period local cowmen supplied the milk; originally cows had been kept in open fields but as buildings were developed and there was less open space the cows were kept in sheds that opened onto the streets. Their milk was of poor quality and was often watered down by milkmen. 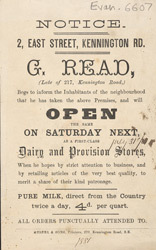 With the developments of the railways, milk (kept in special mechanical coolers), could be transported to the city from the countryside to be sold in general provision stores like the one advertised in this leaflet.